Don't we all love a good garage sale and just imagine if over 400,000 Australians hit the street at once on a massive 5th annual garage sale trail. This is exactly what is happening on Saturday the 24th of October 2015 with the claim "No garage will be safe". Garage sales are wonderful ways to declutter, reuse and recycle products, reduce your waste in landfill and even as a social event where you get to meet your neighbors and assist them to do some fundraising. It is free to get involved and any household, community group, school or business can get involved. It is an all day event and is located right across Australia. You can go to the website and enter the suburb you live in to see all of the different garage sale that are available near you. Or as a tip to perhaps look for the more affluent suburbs and see who's having a garage sale in those areas to really pick up some bargains. If you would like, you can even register to have your own garage sale listed on the website. It will be put on a map where it can be seen and accessed by thousands of shoppers. To assist you even further, when you register you will be provided with downloadable posters, fliers and social media tools. In 2015 the first 2500 registered sellers will also get a free sellers kit posted to them. It is absolutely free and anyone can get involved. Whether you want to hunt for treasure, recycle and reuse or simply declutter your house and make a bit of extra money. In 2014 over 350,000 people participated in the garage sale trail and they estimated 2.9 million preloved items went up for sale over 8000 different garages. The statistics say that the average seller made over $300 and met 13 new people in the community on the day. 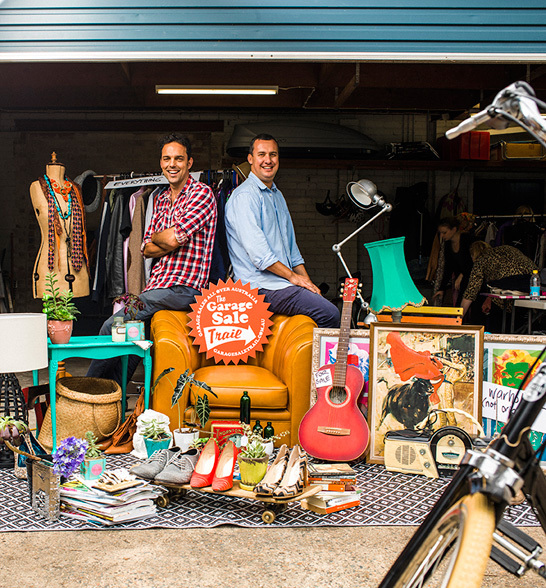 An expected 400,000 Aussies will be hitting the streets for the 5th annual Garage Sale Trail. Phoenix Park Community Centre, in Rob Roy Rd, Malvern East is joining in too at their venue, with lots to see and by including a face painter too. There's also a cafe and playground for the kids to let off steam there too. I'm sure it will be a great day and the temp for the day will be gorgeous, in the mid 20's. Perrrrrrfect! We might bump into each other! I'll keep this in mind for next year. I had been thinking about a garage sale but its a bit close to tackle this year. I joined in the fun. Heaps of people and kids were there today. Parties and Phoenix Park put on a bbq too. Lots of stalls were happening there as well and doneone bought a klaen mower too plus all kinds of beautiful things were up for sale. The face painter was flat out and continued after everyone had packed up and 10% of her takings are going to a charity she supports. Without a doubt it will be on next year. The weather was simply purrrrrrfect! 23C no wind and lots of bright sunshine to match everyone's faces. ****it should read lawn mower! Tablets have a mind of their own sometimes if you blink. **the other word that got jumbled was...." someone bought a lawn mower". Mind you it was a push mower for them to get fit while using it. Make a date to come next year, or ring the Centre to book a stall. That money helps them too.